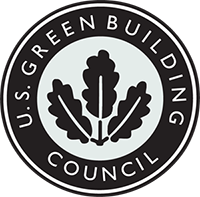 we seek to generate efficiencies and increase productivity through the construction of shops and buildings with LEED certification or eco-friendly systems. For the same reason, S.A.C.I. Falabella is a member of the World Green Building Council, a non-profit organization that aims to promote construction and sustainable development; to encourage technological innovation and the certification of sustainable building; to make efficient use of energy and renewables, including the efficient use of water; to source construction materials from renewable, recyclable and non-toxic resources; and to improve the quality of life and the health of people and communities. 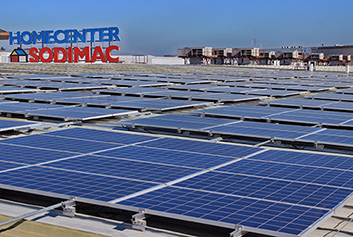 we aim to increase the use of non-conventional renewable energies (NCRE) in our stores and shopping centers. As such, S.A.C.I. Falabella reached an agreement with Acciona Energía to have it supply NCRE to 32 chain stores throughout Chile and to our main distribution center. You can find the statement here. Additionally, our shopping centers made an alliance with ENEL to supply them 100% with NCRE. we are committed to take charge of the waste we generate, promoting recycling initiatives and clean points. In this way, our businesses have been generating alliances that allow us to reduce the environmental impact of our operations. Recycling - National Network of Clean Points: Sodimac has developed in its stores a National Network of Clean Points which throughout Chile have 14 sites dedicated to the recycling of waste by the community in general, in addition to a point located in the central offices of the company to encourage this practice among all its workers. During 2017, the National Clean Point Network recycled more than 2.5 thousand tons. Sustainable products: the sustainable ECO products that Sodimac offers in all its stores respond to the same objective of being an efficient alternative for consumers. In 2016, Sodimac launched the first Circular Economy initiative of any retailer in South America, the result of a strategic alliance with Triciclos and Comberplast, a leading company in polymer injection. Based on plastic waste that is received in the network of clean points, and after a lengthy period of testing and analysis, it proved possible to obtain a recycled pellet of suitable composition for reuse in plastic injection manufacturing, thereby creating quality products for daily use. Subsequent production has commenced using this material in a range of plastic cleaning and storage products, which began to be sold in stores from September 2017. Falabella Cero Residuos: seeks to manage the waste generated by its operation, committing both to promote the prevention of waste generation and to the reduction, reuse, recycling, treatment and final disposal of any waste as the last alternative. 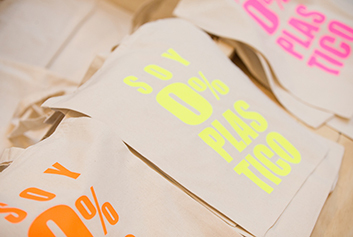 In order to promote recycling within the store and elsewhere, Falabella has been increasing the number of stores with standardized green points throughout Chile, achieving coverage of 84% in 2017. Additionally, during 2017, 51% of all waste generated was recycled. Cleaner Zero Garbage Production Agreement: undertaken in 2017 and seeking to reduce the discharge of waste to landfills. Organic Digestor or Sustainable Waste Disposal System: as part of our integral waste management system, this mechanism both reduces and facilitates the transport of about 300 kilos per day of industrial organic waste collected through the internal recycling system in Mallplaza Egaña. A subsequent aerobic degradation process yields an enriched liquid sufficient for 700 liters of fertilizer per day, all of which is used to irrigate the green areas of the Mall. we measure the carbon footprint of our operations, as part of our commitment to minimizing any impact on the environment and our responsibility toward climate change. 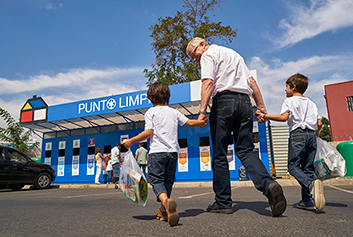 Huella Chile Program: Falabella Retail measures and manages its carbon footprint of Reach 1 and 2 through this program of the Ministry of the Environment. Sodimac measures its carbon footprint with the methodology established in the Greenhouse Gas Protocol, through a process developed internally, with the support of the company Proyectae. 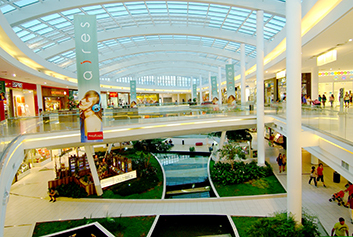 Mallplaza manages its carbon footprint through an agreement with energy distributor ENEL, which as of 2017 certified that 100% of its urban centers are connected to the Central Interconnected System (SIC), supplied with NCRE.